Thanks for tuning back in for the art portion of this play date. The girls actually did two art projects: the mini bouncy ball one I'm gonna tell you about, and giant green shamrock paintings. 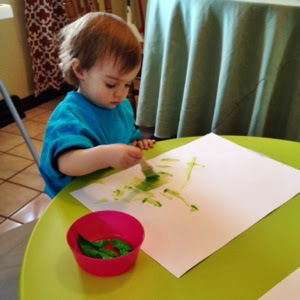 Cate especially loved green shamrock paintbrush practice, but there's not much to blog about. 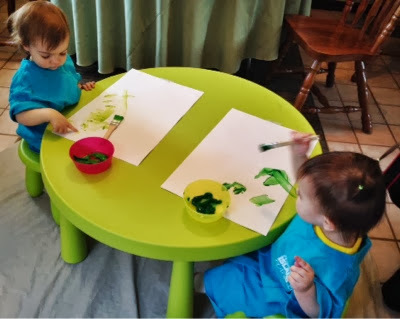 I just drew giant shamrocks on the back of the girls' oversized construction paper, taped the paper to the table, squirted some green paint in bowls for them and let them go to town. Sometimes the projects that are the most fun are the simplest ones. 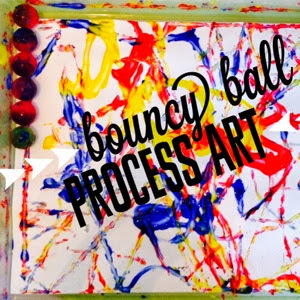 Okay, moving on to the Bouncy Ball Process Art. First of all, don't be intimidated by the term process art. It just means an art project where the focus is not on how the art turns out, but on how much fun you have making it. 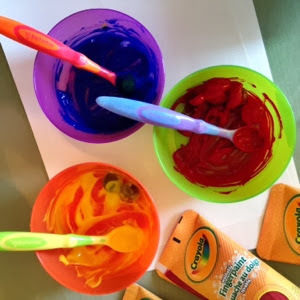 Process art is a great search term for Pinterest if you have babies or toddlers that you plan art for. 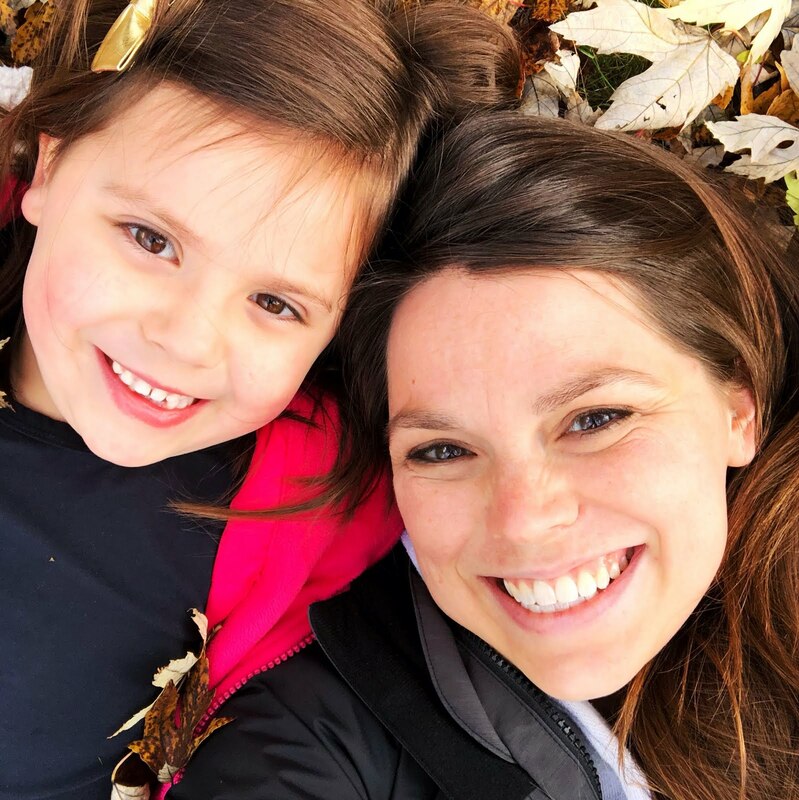 I never would've had a clue what it was if I hadn't been to Early Childhood Education classes or read a million art idea books looking for things for my daycare babies to make. 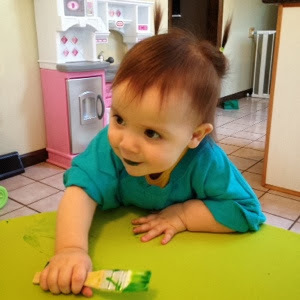 I had the girls use primary colored washable fingerpaint thinking that when it blended together it would make a rainbow effect and be perfect for St. Patrick's Day, but no cigar. They looked super cool anyway, the cleanup is really easy, and I'm pretty sure all kids, big and small, would have fun doing this project. First, you just put a tape roll in each corner of your paper and stick it in the bottom of whatever box you are using. 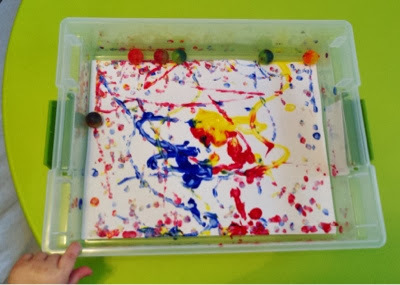 Next, just squirt whatever colors you want into bowls and roll the balls around in the paint until they are totally covered and goopy. 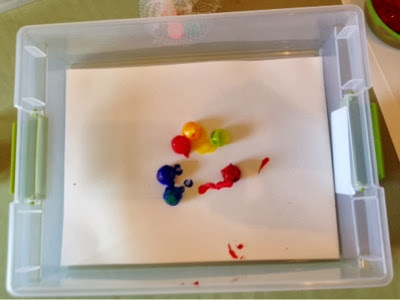 You could do it the traditional way and just squirt your paint right onto the paper and skip the bowls part, but I thought since we were going to be shaking the boxes, the balls might not get enough paint on them to make markings. Your call. 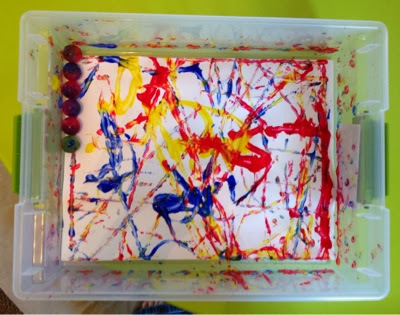 Now, just toss those super painty balls in the box on top of your paper. We used two balls from each color, but this is totally up to you, too. 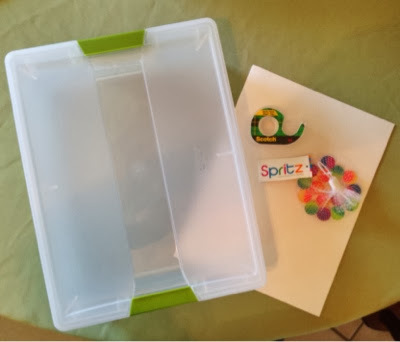 All that's left to do is seal your box up tight, and hand it over to your kiddo to shake, shake, shake! 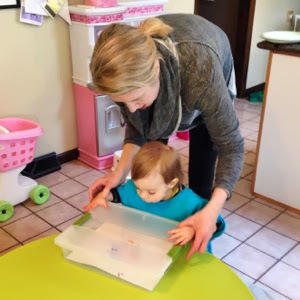 If you use a cereal box, you will probably want to put a piece of masking or packing tape over the end that is open just in case you have an extra vigorous shaker on your hands...I don't wanna be responsible for a bouncy ball painted playroom. 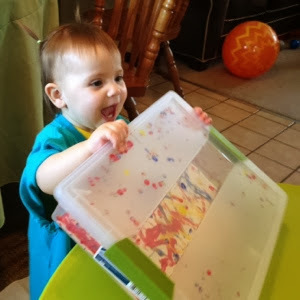 It's so fun to open it up and see how their masterpiece turned out--even with a clear box, you can't tell before the big reveal cause the lid is all covered with paint. Didn't they turn out awesome? Definitely scrapbook worthy. 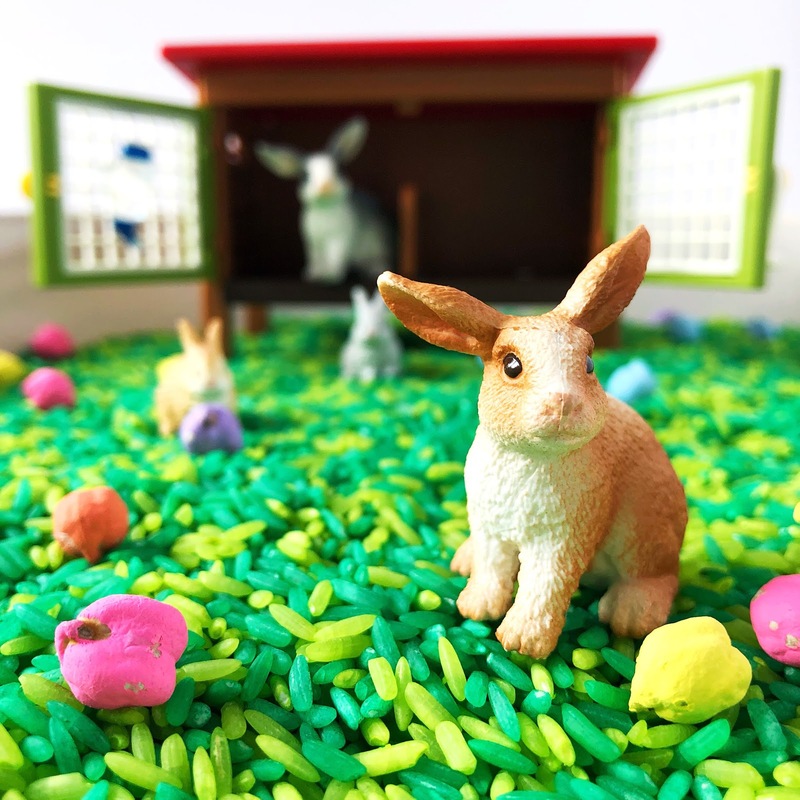 Our little gals have really short attention spans, at least when they are together and surrounded by toys, but even their minute of effort made such beautiful works of process art. There are tons of options for making this project your own. You could use a bunch of different sized bouncy balls, or shake your box while dancing to an 80s dance mix featuring Gloria Estafan and Debbie Gibson, or use way more colors, or just one. So many ways to play! Only one more post left to write about our crazy, over the top play date! Stay tuned...sensory time is up next.